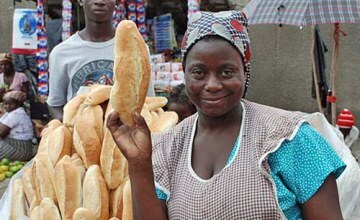 The Minister of Agriculture and Rural Development, Dr. Akinwunmi Adesina, has said that the inclusion of cassava flour into bread processing in the country will generate about N240 billion for local farmers annually. He stated this while delivering a keynote address at the Centre for Value and Leadership lecture held in Lagos. He said, “The cassava bread is not just bread, it’s also about economics. He explained that the ministry is also revamping exports where Nigerian youths will have global dominance in agricultural commodity markets. He further explained that the agricultural sector is getting all the support it needs to ensure that it truly begins to drive the economy, even as a foreign exchange earner. He said that the ministry has been able to secure loans from the banks to the sector to the tune of N25 billion in 2013 from a paltry N3.5 billion in 2011. “The banks recorded zero per cent on all the loan facilities that they made available to farmers for the past two years. This is where the money is going to be made and I think that the banks are stepping up to that,” he said. He further explained that, “To reverse the lack of food manufacturing companies in our rural areas, we launched what we called staple crop processing zones. These zones are areas of high food production.